The Brunswick Fearless is the first bowling ball to feature the Durability Optimization Technology (DOT). This technology by Brunswick was developed to reduce the chance of cracking by enhancing the balls durability. This ball is also the first to have a maufucaturer's 4 year warranty. The Relentless coverstock and Contra core pair up to give this ball an aggressive skid/flip reaction on the backend when used on medium oiled lanes. Check out the latest episode of Lane Side Reviews as they get in depth with the Brunswick Bowling #Fearless, the new #DOT (Durability Optimization Technology), and the #Performance of the new gear. Yes this episode is long, but like the 4-Year Warranty it is WELL worth it. To sum up Brunswick's presentation at their fall pro shop seminars: 2/3 of warrantied bowling balls are due to cracking around the pin (the least dense and weakest part of the bowling ball) when drilled too near the fingers. The Fearless introduces "DOT Technology" pitting the pin on the opposite side of the bowling ball, with a "DOT" marker to denote where the pin would typically be on most traditional bowling balls. This technology allows the finger holes to safely be drilled anywhere on the same hemisphere as the cg and DOT without severely impacting the durability of the bowling ball. Wanting to take advantage of what was once a risky drill zone (and traditionally void of warranty) I laid my Fearless out 40x4x50 having the top right corner of my ring finger hole grazing the "DOT". This layout is designed to give me a fair bit of roll to help control snappy backends and to keep the ball in play on fresh oil. My intention was to replace my recently cracked Vintage Danger Zone by giving me that early/rolly reaction to stay in play when the backends are inconsistent. So far, I've used this ball on 3 patterns - 44' Big Ben in mixed league, as well as the 39' Women's US Open and 37' Broadway in my Challenge league. The first time I used this ball was on the US Women's Open pattern and I had no problem keeping the ball in the pocket. The key for me on this pattern has been to control the back ends as the oil pushes down quite quickly resulting in quick transitions and strange angles. The slower transition from wet to dry allowed me to stick to a small swing to the track, in the pocket and out of trouble even with a low track like mine. My pocket % was exceptional, carry was decent and I avoided the 170/180 games that I was seeing around me. I've used this ball in my mixed league which is on a slick 44' Big Ben. I typically use high performance balls (Quantum Bias usually being my best look) but I wanted to see what the Fearless could do. The length of the pattern was really an issue as I had trouble getting this ball to corner. An early rolling layout on a relatively early rolling ball meant that balls that met the Bias at the breakpoint would 2 pin and getting right into the friction after the seniors carried the oil down begged for a flat 10. I would either need to add polish, increase my rev rate or go with a longer/taller pin if I expect to get results on this pattern. For these longer/slicker patterns where I want to see more hook and downlane motion, I will stick to my Quantum Bias, Kingpins or even my Method. These last few weeks I have ripped it up in my Challenge league on 37' Broadway with 991 and 1029 for my 4 games. The slick house + the shorter pattern means that there is a little more hold than one would normally expect from a shorter 4/1 shot and the slickness of the house keeps urethane out of most everybody's hands. I've usually started with my pin down Kingpin Max to both expose the track at 6-7 but also deal with the heavy volume and early transition, but by the end of the first game I find myself tossing the Fearless. The Fearless gives me the same rolly, safe shape but without eating the heads the way the Max does. My pocket % has been very good as has my carry - seeing the 5 push into the 4-7 on thin hits as well as messengers dancing across the deck to go with a lot of balls that drive through the 8-9. By the end of game 3, I begin to leave weak 10's as I see the ball roll out and that's when it is time to get into my pin Cutting Edge Hybrid and open my angles up a little more. Compared to other balls in my bag, the Fearless is a few boards weaker than my Method and typically has me inch a board or two right of my Cutting Edge Hybrid due to its more subdued motion down the lane. Compared to other flatter shaped balls, it is still considerably stronger than my BTU or Hooligan Taunt, but a little less than the Freakshow Solid. DOT Technology allows a bigger selection of drilling options without voiding manufacture warranty. This ball is a great benchmark middle of the road ball. It is s very readable, smooth, and consistent reaction that I can use on longer and shorter patterns. I like the Fearless at 2000 so I can use it on a little more volume. If you need a "1st ball out of the bag" this is it. The Fearless is my new benchmark ball and I LOVE IT! The sound this ball makes with the Dynamicore technology when it hits the pins in so crisp. It seems to carry everything. To top it off the DOT technology allowed me to do a couple layouts that I normally have to adjust for due to the pin placement. I set this ball up 60x3.75x40 that gave the ball a very controlled flip on the backend. I can't wait to play with this ball on the Chameleon oil pattern. The Fearless, featuring the new DOT technology is my go to benchmark for any condition. It has a clean skid through the front while reading the midlane and has a smooth and predictable angular motion in the backend. I laid this one out with these angles to get the ball started reading the midlane a little quicker while not sacrificing any downlane motion. Definitely a ball that will be seeing a lot of lane time in my future and should be in everyone arsenal. The Fearless is Brunswick’s first ball to utilize the DOT technology. It allows you to drill virtually anywhere you want without fear of voiding your warranty. It is quite fantastic to know you have a 4-year warranty on your side and the extra hitting power of the Dynamicore technology. 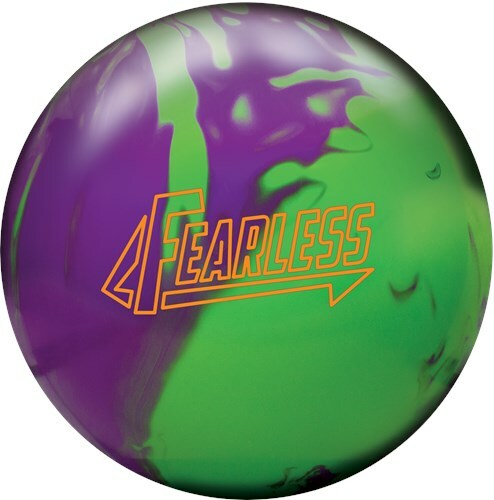 The Fearless has quickly become the first ball out of my bag on our league conditions and my current favorite. It is a full step down from my Method and is just a little bit longer down the lane than the Vintage Inferno. I find that I can start right with this one in the track area and work my way left throughout the night with full confidence that I will carry the corners. This ball seems to have the unique ability to get down the lane, come around the back corner hard, and still maintain a readable reaction. The Fearless should work well for most styles. The affordable price, great ball motion, 4-year warranty, and great hitting power make the Fearless a great option that will work well for most styles. First, the Fearless uses Brunswick’s new Durability Optimization Technology (DOT) that has an unrestricted drill area. This ball is best suited for medium to oily conditions but have found great success with this ball on a typical house shot and shorter sport or challenge patterns where there is plenty of head oil. This is an incredibly versatile ball. The new DOT technology allows you to lay this ball out any way you choose, with guaranteed performance. I decided to drill mine 45 x 4 1/4 x 35. This ball with its advanced flip 73 rating allows for the stronger drilling and yet a strong arcing motion on the back end. Laying off the drill angle will allow the bowler to see more of a flip motion to this ball, drill angle of 70 degrees for example. I’ve found the cover to be very versatile as well, and this ball really seems to have the best ball motion when I have the surface at 3000. I really think this can be a benchmark ball for most bowlers and this ball will match up incredibly well on house patterns.Feel free to contact me by email with any questions; troy_300_1999@yahoo.com. DOT placed above Bridge touching both finger holes placement i love that i cannot do with any other ball due to warranty. I'm a little late to party on this review, and for good reason. every ball with similar layout in past which have not done in aver 3 years have cracked within 2-3 months. I wanted to give this ball and technology proper testing because in past. i with this placement I have never have balls last no matter the company. This ball has not lasted over 3 months and over 200 games on it!!!!!! no cracks, no stress marks i am able to play parts of the lanes i have previously forgotten how to use. This ball takes on its name when it comes to drilling. FEARLESS!!!!!!! This DOT technology is not joking matter it works helps keep the integrity in the ball. BE FEARLESS go out and get your DOT ball today! I drilled the Fearless similar to my Method, which is my first ball out of the bag. What I found was that the Fearless gave me a little more motion on the typical house shot. I played with the cover and found that I liked it with a little more surface as opposed to shiny. As a shiny ball, it felt a bit too strong for when the lanes hooked when I have The Cutting Edge in my bag for that. I'm a tweener so don't always see be separation in ball motion between balls, but a couple of hi rev players really seemed to get the Fearless to corner much more than the Method. I see a bit of that, but for my league, I didn't need that motion as much. Definitely a ball to have in the bag. From what I see, it will be very beneficial to hi rev or players with a lot of tilt or rotation off the hand.